I seldom feature currency funds but the market’s recent sell-off is presenting a potential investment opportunity through the Swiss franc. Although the U.S. dollar often is a currency that holds up well in times of trouble, the Swiss franc is another fairly stable currency amid uncertainty. The CurrencyShares Swiss Franc Trust (FXF) is a fund that provides a way to capitalize on the franc’s potential ascent compared to the U.S. dollar. FXF has held up fairly well so far in 2012, despite a wave of bad economic news in Europe during the past month. After beginning the year at $105.96, the exchange-traded fund (ETF) rose to a high of $110.33, before falling in recent weeks to hit $101.74 today. In light of the pullback in FXF, we may be on the verge of a good entry point for the fund. News about growing fiscal problems in Greece and Spain, as well as the election of austerity-resistant new leaders in Greece and France, already has been factored into the franc’s recent retreat. Established in June 2006, CurrencyShares Swiss Franc Trust (FXF) is designed to track the price of the Swiss franc net of Trust expenses, which are expected to be paid from interest earned on the deposited Swiss francs. The Swiss franc is the national currency of Switzerland and Liechtenstein, so it is not as vulnerable as the euro to the drag of financially weak countries such as Greece and Spain. In addition, the Swiss franc is the sixth-most-traded currency in the world, accounting for 6.4% of global foreign exchange transactions. FXF makes the most sense for investors who believe that the U.S. dollar has strengthened to the point where it will weaken compared to the Swiss franc. 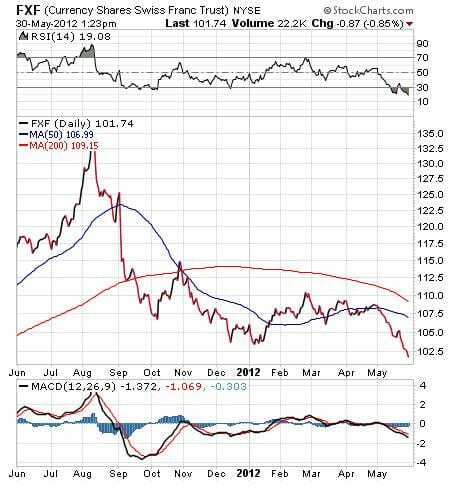 The fund itself continues to trade at a slight discount to its net asset value (NAV) of $102.88. I like to buy closed-end funds when they are trading at a discount. Even though FXF has slipped in the past month, the Swiss franc could be poised to make significant gains in the coming months if Europe begins to find answers to its various problems.